In this June 17, 2017 file photo, the scorched remains of Grenfell Tower stand after a massive fire raced through the 24-story high-rise apartment building in west London. 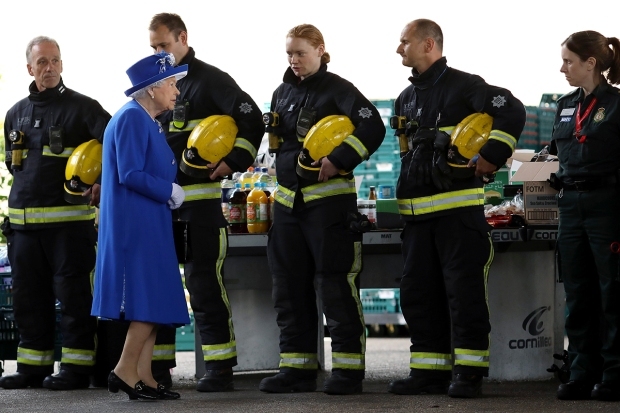 British police have described the painstaking work of recovering remains from a burnt-out London high-rise, four weeks after the disaster killed at least 80 people. The Metropolitan Police force says it will take months to identify all the victims, and the agonizing wait has provoked anger and dismay from victim's families. 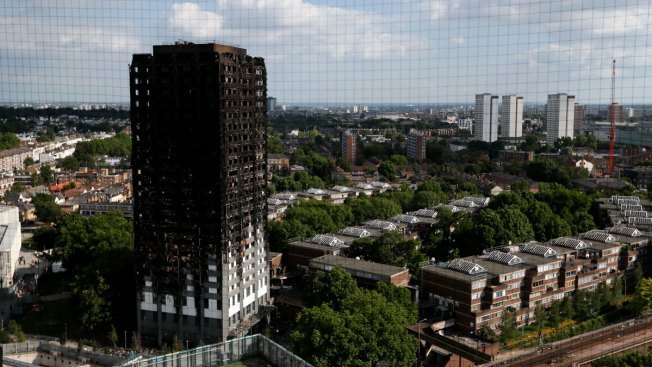 The U.S. company that manufactured panels on a London apartment tower where at least 80 people perished in an inferno has quit selling them for high-rises because it has no control over their installation, a top company executive said Monday. Arconic Inc. is continuing to work with investigators to determine what caused the flames to spread so rapidly at Grenfell Tower on June 14, interim CEO David Hess told investors during an earnings call. "Cladding systems contain various components selected and put together by architects, contractors, fabricators and building owners, and those parties are responsible for ensuring that the cladding systems are compliant under the appropriate codes and regulations," the company said in a news release Monday. About 12 days after the blaze, the company announced it would discontinue making its Reynobond PE panels available for high-rises. That decision was made out of "an abundance of caution as Arconic does not control the ultimate design and installation of the final cladding system," the company said. "We extend our deepest sympathies to those who have lost so much," Hess added Monday. An Associated Press review this month found that some building owners in the U.S. were unaware that the same Reynobond panels, which feature a polyethylene core, were used on their buildings as well. Polyethylene is combustible, according to federal agencies including the Centers for Disease Control and Prevention. In many cases, building owners and regulators did not know the product was used on their structures, or exactly how it was applied. In several cases, old building records had been destroyed. Among U.S. buildings that used this cladding is the Baltimore Marriott Waterfront hotel, which towers than 30 stories over the city's harbor; the Cleveland Browns' stadium; and a school in Alaska, according to Arconic brochures. Cleveland city officials say it was installed on the stadium in a different way, and that the venue is safe for fans. No one has declared any of the U.S. buildings unsafe, nor has the U.S. government ordered widespread testing of building panels that British authorities ordered after the London catastrophe. But in the wake of the London fire, samples were collected from the exterior of the hotel in Baltimore, and test results are expected soon, a Marriott spokesman has said. Arconic has corporate offices in Pittsburgh and New York. Its Reynobond product has been on the market since it was first produced in 1989 at the company's manufacturing plant in Eastman, Georgia.